CHEF SANDWICH: Cambodia’s Booming – So Why Is It The ‘Least Thriving Country In The World’? I read a column in the Bangkok Post this week, entitled Poor Cambodia Not Looking So ‘Poor’ Anymore, which began as a thank you letter congratulating Cambodian PM Hun Sen for his hospitality during the ASEAN summit. The letter took a swipe at the obvious wealth in Phnom Penh, mentioning how everyone was now the proud owner of a Lexus, and questioning whether the Kingdom still needed the huge amount of foreign aid it receives, when the streets were so obviously paved in gold. 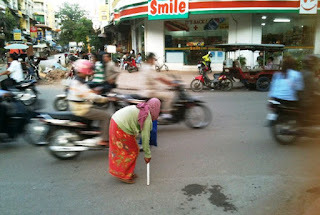 Although the article pondered whether the word “poor” now only applies to the rural population, and whether any of the aid money actually reaches Cambodians in need, it’s a shame that foreign correspondents didn’t stray further than the scrubbed streets of the capital, which had been cleared of beggars and other unsightly features, and go in search of the truth themselves. A quick trip into villages far from main roads would have shown the appalling poverty, malnutrition, stunted growth, and lack of education and healthcare. It would have hammered home how little money has trickled down to the people it’s supposed to help. “What’s that? There’s a new Range Rover coming out?” And that’s just the NGOs. John Macgregor, from the Lom Orng Organisation, an NGO which doesn’t use SUVs or consultants, and is helping flood victims in north-west Cambodia, gives a very depressing picture of life in some villages. He says residents in one rice-growing commune on the Thai border are spending nearly half of their disposal income just on trucked-in water and medical bills.